Let’s start with my favorites! Under Eye Corrector– I am not a foundation girl. Since young, I just couldn’t handle the feeling of makeup all over my face (I felt like my skin was suffocating) but that doesn’t mean I still didn’t need to cover up the bags under my eyes or the redness on my chin. I use this corrector every single day under my eyes and to cover up any blemishes. Liquid Eyeliner Pen– So, I confess! I am terrible at applying eyeliner. When my sister told me about this eyeliner that was so easy even “I”, hehe, could do it, I was on board. And she was right. It glides on (thick or thin: your choice), doesn’t smudge unless I really screw up, lol and instantly dries. Volumizing Brow Tint– This is genuinely the best eyebrow product I have ever used. Gals, you know how important a great brow is and you also know how long it can take to truly perfect the art of “filling in your brows”. Apply the volumizing tint lightly to your brow for a great every day eyebrow. 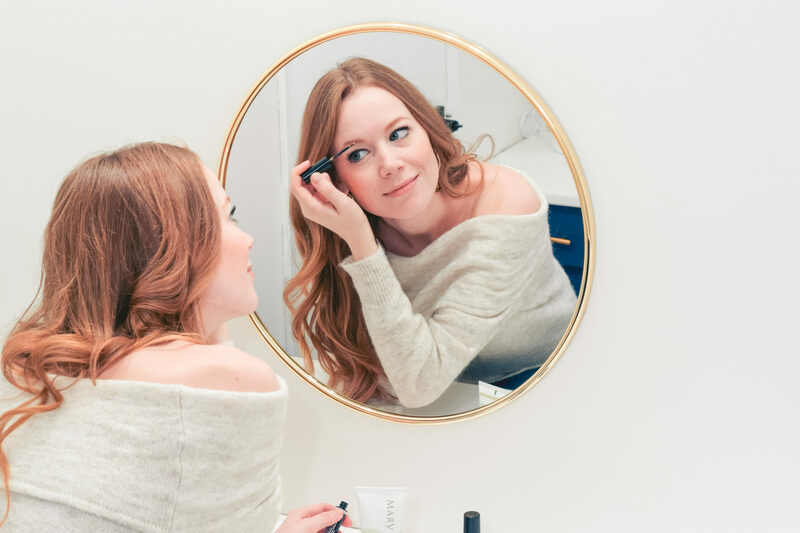 It took me a couple times playing around with it to get the knack but once I did it is so easy and fast compared to other brow products I have used! Applying it lightly is key. On the weekends I fill them in with a shadow and then apply the tint over top for a little more drama. But day to day this product alone is more than sufficient! Makeup Finishing Spray– I honestly don’t know if this spray keeps my makeup on any longer or fresher but I do know I am weirdly obsessed. It is SO refreshing!!! I actually look forward to finishing my makeup just so I can use it. Rejuvabeads– Are you obsessed with long locks like myself? If you are, I have you covered with rejuvabeads. This is a split end mender and as doubtful as you may be, it truly works. While this does not replace your need for trims with your stylist, it will keep your locks fresh and full in between your visits. If you are curious about this hair product line, I did a blog on my experience (still using all of their hair products) at https://lady-styles.com/hair-transformation-with-monat. Does anyone else suffer from dry lips all winter long? Nivea lip chap keeps me hydrated for the dry months and I really enjoy this NYX gloss for enhancing my natural lip color. Great post! Mary Kay is such a good brand, the color corrector comes in handy for me all the time!